I can’t believe I am just now sharing this wedding! It is crazy how time flies!! Heather & Brandon’s wedding at the Adolphus Hotel in Dallas TX was magical (I know that is cheezy but guys I promise you it was lol) From the venue itself to the lush floral arrangements to the confetti exit, it is a wedding you will want to check out! Heather & Brandon’s ceremony was held at Perkins Chapel in Dallas TX on a beautiful spring day in May! 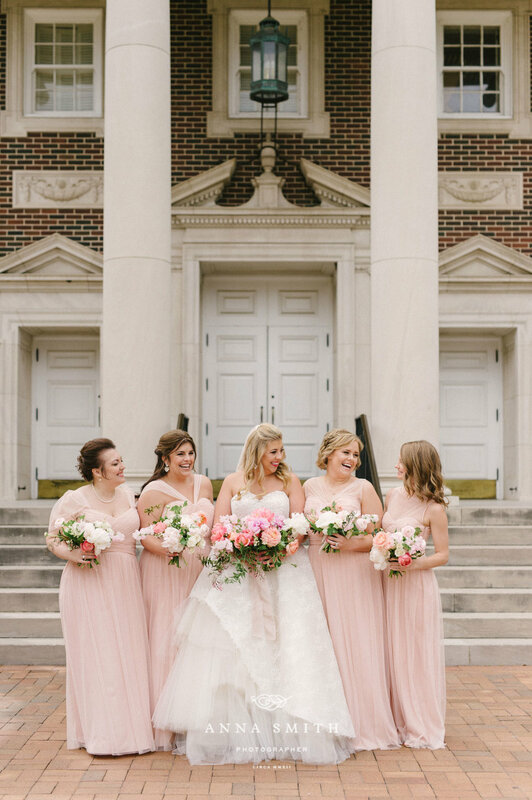 The altar was decorated with two large pink floral arrangements on acrylic stands, and guests could hear the string quartet playing as they found their seat. The bridesmaids wore long blush dresses and held blush and white florals, and the groomsmen wore navy suites. After the ceremony, as the couple took pictures with their families at the chapel, the guests headed to the reception at the Adolphus Hotel in Dallas TX. Where they were greeted with pass hors-d'oeuvres. The reception was held at the Adolphus Hotel in downtown Dallas, and as guests walked into the reception, they found their seat in the room filled with round tables, each with table number with a gold stand. The head table was located right in front of the dance floor of the Adolphus Hotel ballroom and had gold-rimmed chargers, tall lush floral centerpieces, and a romantic garland down the center of the table. All the reception tables had ivory linens; romantic centerpieces, and candles, and each place setting had blush napkins with greenery next to each menu. If you want to see more of this gorgeous ballroom wedding at the Adolphus Hotel, be sure to click HERE to see it in the most recent Brides of North Texas Magazine!